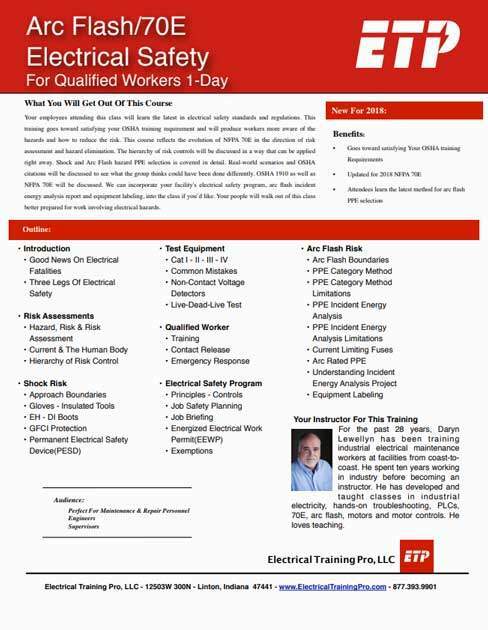 Your employees participating in this class will learn the latest in electrical safety standards and regulations. This training goes toward satisfying your OSHA training requirement and will produce workers more aware of the hazards and how to reduce the risk. This course reflects the evolution of NFPA 70E in the direction of risk assessment and hazard elimination. The hierarchy of risk controls will be discussed in a way that can be applied right away. Shock and Arc Flash hazard PPE selection is covered in detail. Real-world scenarios and OSHA citations will be discussed. OSHA 1910 as well as NFPA 70E will be discussed. We can incorporate your facility’s electrical safety program, arc flash incident energy analysis report and equipment labeling, into the class if you’d like. Your people will walk out of this class better prepared for work involving electrical hazards. Upon purchase of this program, an email will be sent to you containing the links for accessing the training. The webinar is four hours in length but can vary based on the number of questions. The instructor shares the presentation slides and will deliver the course. The instructor’s voice will be heard on your computer audio; no telephones need be involved. Attendees will speak to the instructor using a microphone, your computer’s or an external mic connected to your computer. Attendees will be muted but can ask questions by raising their hand and being temporarily unmuted or typing the question into the chat box. The instructor will hear your voice over their computer audio and answer live. Attendees can be logged in as a group with several people watching the same screen in a conference room, or individually at a separate location. This course can be viewed on a mobile device, but the quality may suffer. The employer will verify who attended and share that list with us. 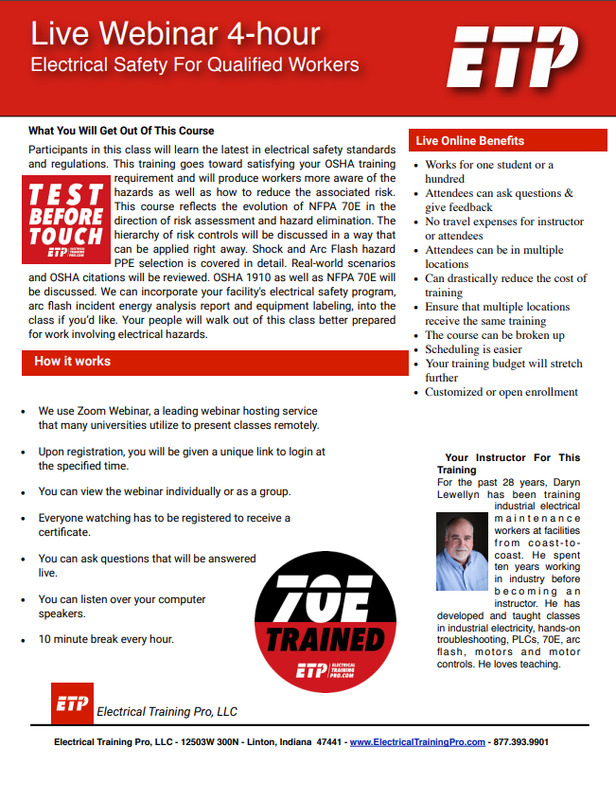 We will send you a printed certificate for each attendee, “70E Trained” and “Test Before Touch” decals. These 2-inch decals are great for toolboxes, hardhats, lunchboxes, and electrical panels. A sign-in sheet, and a pdf file containing course slides for your documentation requirements. Upon purchase of this program, an email will be sent to you with the links for accessing the training and details on how it will work. We use Zoom video conferencing service. Can be customized for your site. It is not uncommon that this is the only training option that works for some companies.